Benzene is a colorless chemical found naturally in the air and is one of the most frequently used chemicals in U.S. industry. Benzene enters the air through both natural occurrences, such as forest fires, and human activity, such as burning fossil fuels. 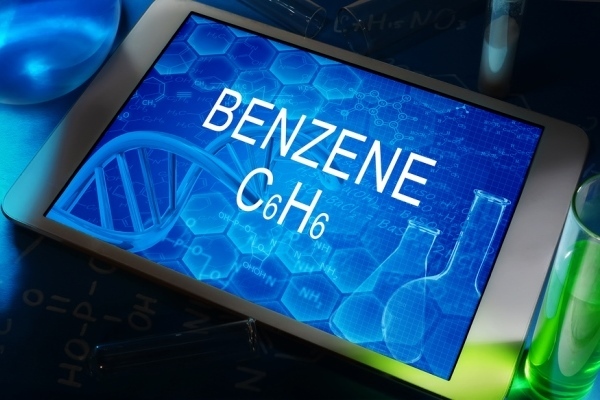 Common sources of benzene that lead to human exposure include emissions from burning oil and coal, motor vehicle exhaust, gasoline, other fuels, solvents, paint and glue. In addition, benzene is widely used in the manufacture of many substances and products, such as plastics, rubbers, resins, lubricants, dyes, detergents, pesticides, and more. The severity of the injuries caused by exposure to benzene depends on the amount of benzene that individuals are exposed to and the length of time that they are exposed. Short term exposure to benzene can lead to irritation of the respiratory tract, eyes, and skin, and can even lead to dizziness, drowsiness, and unconsciousness at higher levels. Long-term exposure to benzene has been linked to life-threatening side effects such as anemia and cancer, most notably different forms of leukemia. The Environmental Protection Agency, or EPA, has classified benzene as a Group A human carcinogen and the Department of Health and Human Services has indicated that benzene causes cancer in humans. Benzene has been linked to an increased risk of leukemia, which is a cancer of the bone marrow. The bone marrow is where the white blood cells are made in the body. Those most likely to be exposed to high levels of benzene, causing benzene poisoning, are those who work in the manufacturing of benzene or that work in an industry that uses benzene in their products. If you or a family member has been exposed to benzene and noticed adverse side effects and would like to discuss your rights, contact us and a member of Scovern Law’s experienced staff will call you to discuss your potential rights concerning benzene. Attorney consultations incur no obligation on your part and all initial consultations are free of charge and do not create an attorney-client relationship. Contact us at 1.888.725.1890.